"Puff pastry with a custard cream filling. Garnish with melted chocolate or a dusting of confectioners' sugar." For the custard: In a small saucepan, combine 1/2 cup sugar, 5 tablespoons flour and a pinch of salt. Stir in milk, a little at a time, until smooth. Bring to a boil over medium heat, stirring constantly. Boil 60 seconds, then pour a small amount of hot liquid into the 2 egg yolks, and stir. Then return now heated egg yolks to saucepan and stir, over heat, until mixture starts to bubble again. Remove from heat, add vanilla. Cover and chill in refrigerator. For the pastry: In a medium saucepan, combine shortening and water and bring to a boil. Sift together 1 cup flour and a pinch of salt and pour all at once into boiling mixture. Stir vigorously until mixture forms a ball. Remove from heat, and add eggs, one at a time, stirring vigorously after each addition. Drop by spoonfuls onto baking sheet, or pipe into desired shape. Bake 10 minutes in the preheated oven, then reduce heat to 400 degrees F (200 degrees C) and bake 25 minutes more, or until golden. Cool completely, split, fill with custard, and replace tops. The pastry didn't have much flavor :(, need to sweeten it up a bit. That filling is good though!!! I HAVE MADE ANOTHER VERSION BEFORE THAT TURNED OUT GREAT HOWEVER WITH THIS ONE THE CREAM PUFFS DID NOT HOLLOW OUT WHEN THEY BAKED. THEY JUST STAYED DENSE. This was the easiest recipe I have tried in along time. These were delicioso!!! Could not stop eating them. The cream is wonderful. Easy and delicious. 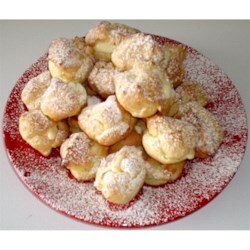 My friends keep telling me they loved my cream puffs.